Over the last three years we have seen some incredible children's theatre; inspiring, thought provoking, exqusitely beautiful. This magical corucopia always flows to its greatest excess around Christmas and again this year we've been lucky to be invited along to some of the most wonderful festive offerings from some of our favourite theatres. With the advent of children, the enchantment of Christmas returns with all its glory, and when I look back on my childhood what remains with me is not the plastic paraphenalia, the material or gastronomic glut that we have come to associate with the season; it is the family time, the carols, the stories and the experiences. I have no doubt that our festive concerts and theatre trips will remain tightly woven into the fabric of the girls' childhood memories; more valuable than toys, and with the potential to be renewed annually. Here are four brilliant shows we have seen over the last two years and highly recommend, some still available this year, most perennially available every Christmas - a testament to their enduring appeal. 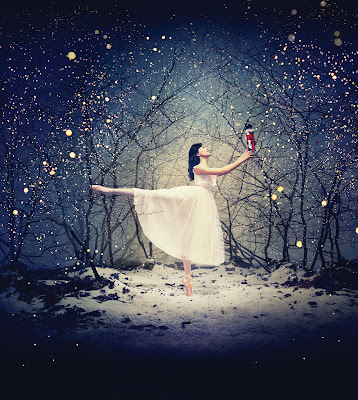 Last year I wrote that if it were possible to pinpoint the single most influential and enduring cultural moment in Culturebaby's life to date, without doubt I'd look to our trip to see the English National Ballet's gloriously Edwardian and throroughly spellbinding production of Tchaikovsky's The Nutcracker in January of 2015. Last year we returned to experience one of their special under 5s performances (no different - just children of all ages welcome). 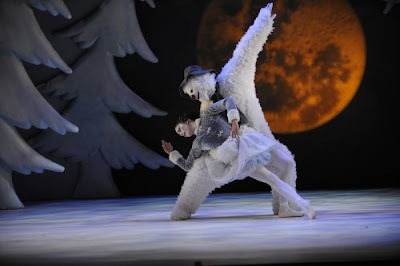 This production is the perfect first introduction to ballet for a child. Short, fast moving, easily intelligible and gloriously visual. The music is distinctive and memorable; the costumes the stuff of childhood dreams. The whole experience is the epitome of Christmas enchantment with its story of a unique present, gifted by a beloved Godfather: a Nutcracker who comes to life, whisking our heroine Clara away from the clutches of an army of mice to a distant land of sweets. 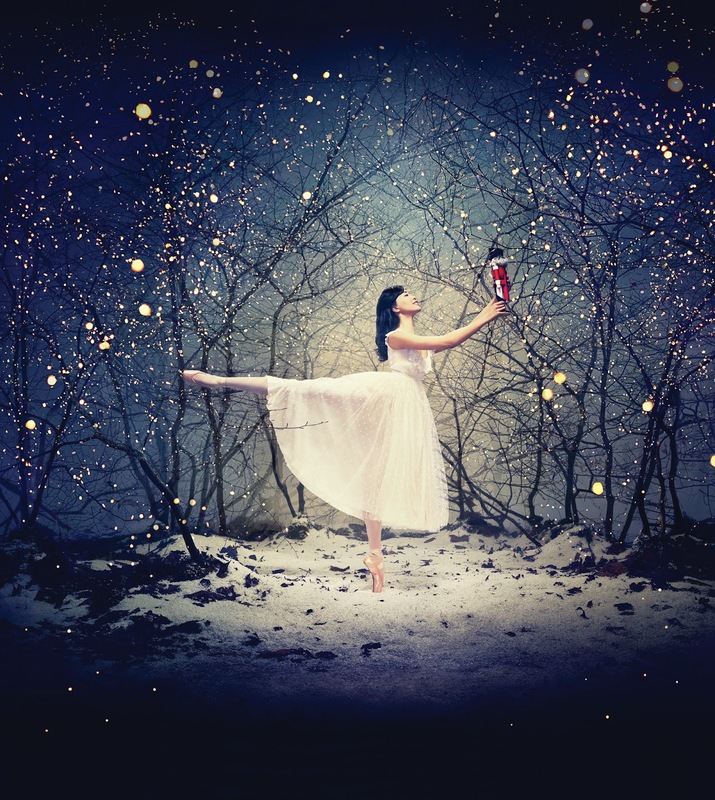 If, like mine, your children are in love with their ballet slippers, I can't think of a better Christmas present than this performance with its host of talented young children providing a tangible goal for our aspiring dancers. The Nutcracker was the first ballet I saw as a child and I still remember it, but it wasn't by the ENB and I wasn't three. I was initially hesitant, unsure whether this was too soon. Would they sit still? Would it be too frightening? I needn't have worried. By no means an unusual toddler, and as prone to fidgetting as any, Culturebaby sat utterly entranced throughout the entire production, and not only that; she lived it daily for the following six months. Every day she requested to listen to the full ballet as she played, and on many an occasion she watched the Kirov's production on DVD and copied the steps. She created again and again the land of sweets with materials as diverse as playdoh, confectionaries and crayon. She saw the theme everywhere from the art of Hunderwasser to the decoration of a cupcake. Our old wooden nutcracker and a stuffed toy mouse were constant companions. We looked for every possible version of the story available. So last year I had no hesitation about bringing our just 2 year old along to the family performance. Accustomed to the soundtrack and excited by the chance to finally see it too, she hummed along and sat equally engaged throughout. I had thought that three was a stretch for a first ballet, now I'm completely convinced that a toddler will gain much from the experience too. The girls act out theatre productions at home, they create dances. These experiences are becoming part of their lexicon and life. I'm so glad we started so early. For Nutcracker-inspired activities see here. The other, less traditional, first ballet we attended with (then) a three year old Culturebaby was the gorgeous stage show of the classic Briggs' tale The Snowman, presented by Sadler's Wells and the Birmingham Repertory Theatre at the Peacock and now in its 19th year. Christmas for me, more than any other season, is the time for memories, for dreaming and re-gaining the wonder in life and little encapsulates this sensation better than this beautiful story coupled with Howard Blake's ingenious score. Pieces like this matter, they train a child's ear, stretch the imagination and instil a life-long love of music. We've returned to this performance now every year and it still holds every inch as much enchantment as when we first saw it together. This year we were in the stalls, close to the action and literally able to dance in the snow falling at the coda, with its optimistic implication that our eponymous hero could return. The production is gorgeous. It is peppered with humour (with its oversized animals, comedic household discoveries and dancing fruit) and though the set is relatively simple the props are very effective. The scene when the toys come to life in James' room is particularly lovely. 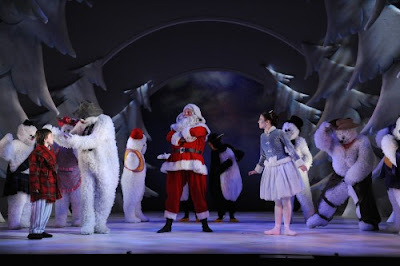 The choreography is great - the dance of the Snowman is a joy to watch, there are instruments on stage and singing, a motorbike and, to the girls' delight, a 'real ballerina' complete with tutu. 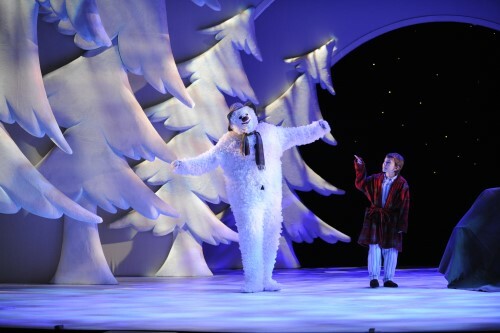 The entire audience burst into spontaneous applause this year as both Snowman and James took to the air on strings. Culturebaby, remembering moments from last year, waited with impatient anticipation for the arrival of the gymnastic and rather sinister Jack Frost. One of the truly wonderful elements of this experience is that the entire audience know the story and ritual-like enter into the story together. They know it, they love it, and they cheer it on to its inevitable sadness-tinged ending. The Snowman is a Christmas tradition and a rite of passage. It is a tale of belief, living life to the full and dealing with loss. For us parents that too may include the loss of our own childhood - but immersing ourselves anew into this story whilst clutching our delighted babies, we too can re-visit the wonder and see yet more layers of meaning in this most ingenious of Christmas tales. For a selection of Snowman themed activities see here. 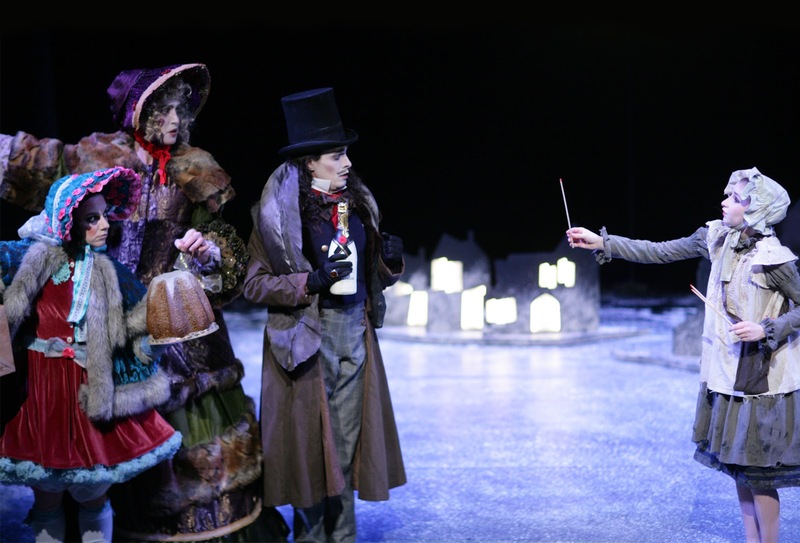 Arthur Pita's dance theatre adaptation of the Hans Christian Andersen classic is a refreshingly different sort of Christmas tale. In its fundamentals the story of the little girl is truly tragic, but this adaptation combines the sad with the hopeful and more than anything gives us pause for thought in this cold season about what more we ought to be doing for those in need. One of the loveliest things about my five year old is that she hasn't become hardened to the world. Like many children she is full of compassion and cannot understand why the rest of the world can be so unthinking. She cannot walk pass a homeless person on the streets of London without emptying her bag of food and handing it over. I hope that she will never lose this urge. She really related to this story of Fiammetta, a young girl in an imaginary Italian town who is forced to sell matches in the bitter cold. The little girl is full of joy, but also experiences great cruelty at the hands of those in competition with her and wealthy families who do not want to associate themselves with the poor. When she has her shoes stolen and her matches burned, the little girl begs for help with no success. She is chased away from the warmth and to her Grandmother's grave where, burning her few remaining matches, she dies. She is discovered too late by townspeople who had rejected her. But then comes an element of hope - the spirit of her loving grandmother guides her away from the cruel earth and to the moon from where she is able to watch over the little match girls of the future. She is warm and free. 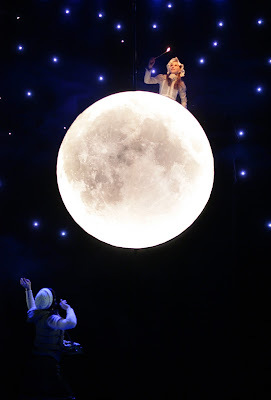 The dancing is gorgeous, the scenery (such as the glowing moon) really beautiful, and even such a tragic tale is effectively infused with comedy and lightheartedness. Though there is no English dialogue (it has a little Italian in the songs) this is surprisingly no issue. The acting speaks for itself. It was a truly refreshing experience and one which has stayed both with me and with the children. Culturebaby wants to do some fundraising at school for the homeless. If she's taken this away as a Christmas message from this brilliant production, there is little more valuable. To accompany this show I'd recommend the beautiful Taschen Fairy Tales of Hans Christian Andersen, which contains this classic story amongst 23 others with stunning artwork from 1840 through to 1980 from a wide range of countries. Taschen is so good at producing compliation volumes that themselves are works of art to treasure. We gave this beautiful volume to the girls as a Christmas gift. We've properly discovered the wonderful children's theatre, The Unicorn, this year. The theatre, which has a home near London Bridge, was founded by Caryl Jenner as a touring company in 1947 with a commitment to giving children a valuable, and often first ever, experience of quality theatre, and a philosophy that 'the best of theatre for children should be judged on the same high standards of writing, directing, acting and design as the best of adult theatre'. Today, the Unicorn is the UK's leading professional theatre for young audiences, dedicated to inspiring and invigorating young people of all ages, perspectives and abilities, and empowering them to explore the world – on their own terms – through theatre. It is a wonderful, welcoming, space and we've loved visiting in recent months. 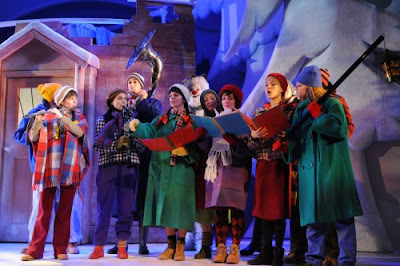 This Christmas we went to see the quirky Baddies the Musical, which returned to the theatre this year. It's a fun take on the fairytale world, examining what might happen if you were to extricate the baddies from their respective tales, leaving only the sunnier storylines. Inevitably we see that they are in fact required. Life is made up of contrasts: light is only understood in contrast with the dark, goodness when opposed by malevolence. We are also led to examine what are goodness and badness anyway? Intentionality matters. The cast is brilliant - the 'ugly' sisters have stunning voices and harmonics, Rumpelstiltskin in his efforts to be taken seriously is really quite adorable and Peter Pan is charmingly unpleasant. It's a fun musical adventure, but one with a deeper message and frankly I'd take this over a pantomime any day. You need the bad guys - especially when they can sing. Disclaimer: we received tickets to the first three of these performances for the purposes of a frank review, and to the Unicorn in our role as ambassadors. All views are entirely our own.